Posted October 18, 2014 by Malcolm Stewart & filed under Episodes. There’s nothing flat about this week’s episode of Doctor Who. Occupying the slot, and something of the feel, of the traditional Doctor-lite episode, ‘Flatline’, in the event, proves to be not so light on Doctor. 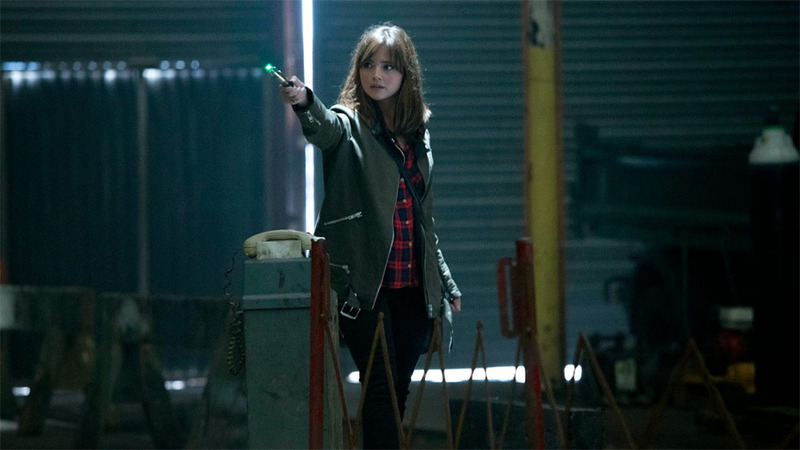 Whether it’s Peter Capaldi delivering a performance that is literally out of the box, or Jenna Coleman’s Clara stepping up to the plate as our locum Doctor for the episode, we have more Doctor for our buck – and more companion too, with Joivan Wade’s Banksy-esque Rigsy fulfilling the role of intuitive question-asker. That Clara acquits herself so well when becoming ‘Doctor Oswald’ is no surprise, given her tendency to bossy self-assurance, but she is markedly less pompous than the Doctor has the tendency to be. After all, she knows how ridiculous his act is more than anyone. The actual premise of the episode – of human beings trapped in two dimensions, and two-dimensional beings learning to be human – feels like it could have come from an old Doctor Who annual, where dripping, surrealist art would have been the only medium cheap enough to render the nightmare images of lurching, painterly flesh. These days, we know CGI is up to the challenge. Even so, the images created feel like a particular step up, even by Doctor Who’s standards. Were they able to do this because of the complete absence of CGI in ‘Listen’? If so, it’s another reason to be grateful that this year’s run has so obviously been conceived as a complete whole. There are moments here to induce nightmares: supporting characters we have met earlier in the episode staggering into view, their features melting and flickering and distorting; a giant fist rearing up to drag away a screaming Al. ‘Flatline’ may not have been billed as ‘the scary episode’, but the clue was so obviously there in that dastardly punning title. This is flatlining in more than one sense. Nor do the visual preoccupations of the episode extend only to the idea of… well, in the absence of learning too much about the alien menace, let’s think of a better name than ‘killer graffiti’ and go for, er, sentient graffiti. The image of the TARDIS, more than ever smaller on the outside, fits perfectly with the idea of compressed space, reminding us that it’s not just the graffiti that is in the habit of crossing dimensions. There are sight gags aplenty, and very good they are too: the Doctor’s “big old face” appearing through the miniaturised TARDIS doors, or the Doctor, on Clara’s instruction, channelling Thing from The Addams Family, and finger-walking the TARDIS to safety. However, as in all the best Doctor Who stories, the gags aren’t just funny: they’re also ingenious – a testament to a programme which can be at its funniest when also at its most mind-expanding. Doctor Who may show great brio when resolving story elements with a bit of gadget-wizardy, but it’s even more glorious when it’s also taking the piss, so it’s fitting that the Doctor’s self-designed 2DIS should be a bit rubbish. The ideas here are so big that writer Jamie Mathieson can throw away the promise of a locked room mystery as a mere tease. The two revelations that resolve it – that the desert is a patch of human skin and the mural a human nervous system – are, in any case, prefigured by the supremely effective opening when Man With Ginger Beard gets flattened into the dado rail. But at no point does the storytelling become over-complex. Setting the story in a recognisable urban setting not only grounds the action, but also gives us an adventure that is more involved with the real world than more recent episodes which have neglected their present-day settings in favour of spacey hi-jinks. In the Russell T Davies era, such things were commonplace, but now it feels like a refreshing novelty to encounter young offenders doing community service, or a city shrine of soft toys and dead flowers. There is a particular joy in having Capaldi dislocated from the action, commenting on it like an over-involved fan – at times one step ahead of the plot, at times exactly simultaneous with Clara. It’s a sub-plot, too, which links into this year’s wider themes of responsibility and cruelty. What the Doctor has ham-fistedly tried to show Clara all season, she learns this week from experience: that sometimes, to give people hope, to give them a chance of survival, you lie. High-minded idealism may have a place in lessons dissecting the aphorisms of Marcus Aurelius and Jane Austen, but not so much when you’re on the run from killer graffiti. To save the day, Clara learns the lesson, but does she become morally compromised in the process? Aired at 8.25pm on Saturday 18 October 2014 on BBC One. Yeah, I keep thinking at some point there will be a mis-step, but this season has been an absolute delight. Agree about the Rubbishy Robin Hood (why did the crticis love it!) 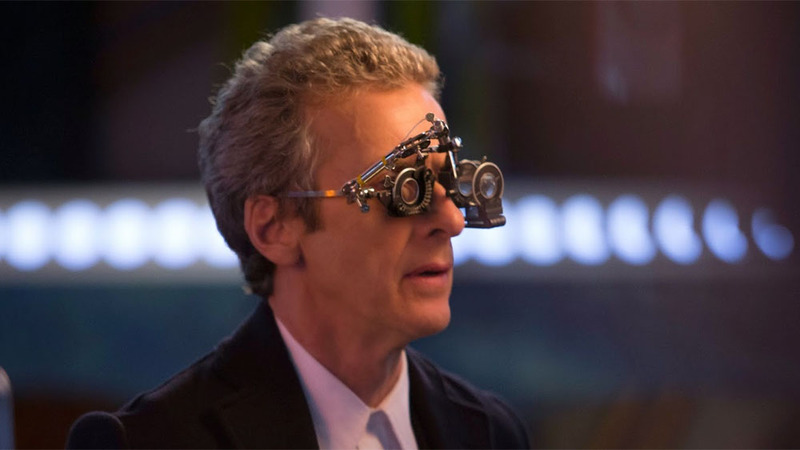 but that episode aside this series, and Capaldi in particular are like an aging wine – stick with it and it becomes highly engagin.g The emphasis on the complex relaities of morality is rather tender in places and far more adult than the rather Peter Pan fantasy we had in previous series. I love the fact that truth and goodness are shown as inherently incredibly difficult to define. Did no one else notice the Tardis looked like the pandorica towards the end there?? This is one of the most startling things I’ve read recently.